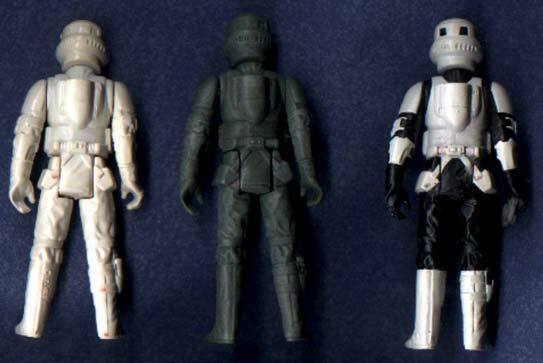 This is a pretty nice series of prototypes relating to the Biker Scout figure. 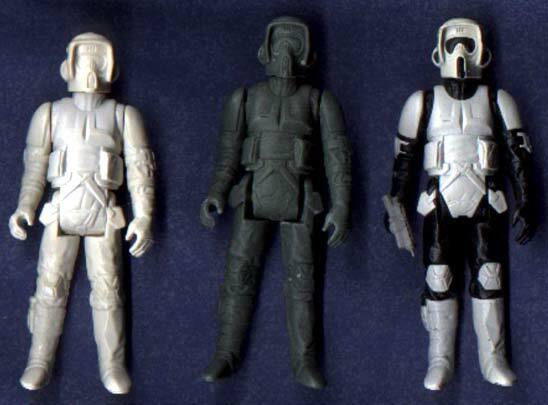 First, on the far right, is an unpainted first shot. It's an early injection-molded production sample, which is completely unpainted. In the center is an unpainted hardcopy. It's a hand-made prototype, composed of a ceramic-like casting material known as Dynacast. Finally, on the right is the best piece: a fully painted hardcopy. It, too,is made of dynacast, but it's been meticulously painted to look just like the production figure. Here you see the backs of the three pieces.